1. Eat your meals regularly. Do not skip breakfast. Breakfast is your morning fuel for the body and the brain to function normally. 2. Maintain ideal body weight and fat. Avoid crash diets and self-prescriptions. Take help from our expert team that will gently guide you towards healthy parameters. 3. Include whole grains, fruits, sprouts and vegetables in your daily diet. 4. Keep yourself well hydrated with water and other nourishing drinks like fresh lime juice, coconut water, buttermilk, clear soup, and so on. 5. Restrict high-fat and high-sugar foods to the minimum. Enjoy them occasionally, if you must. 6. Iron and calcium are 2 important minerals for a woman. Include at least one green leafy vegetable every day, even if it's only for garnish (e.g. - coriander leaves). 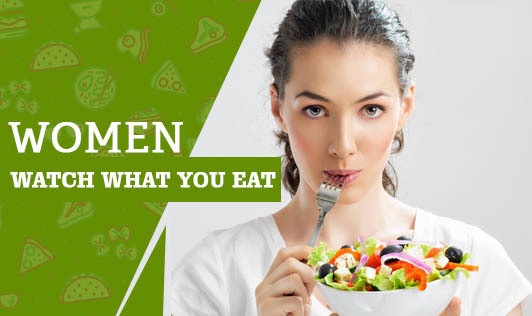 Meat, egg, sprouts, ragi, soybean and nuts are other good sources of these nutrients. 7. If you are pregnant or lactating, ask your dietitian to help you with the right food choices. Don't get carried away by myths and tales. 8. Do not go overboard with coffee and tea, even though they might be quite tempting at work. Use your coffee-break to walk around for exercise. 9. Avoid eating on the run or eating at your office desk. Take a few minutes off to enjoy your meal. Go for a relaxed stroll after your meal. Remember that there's no magic potion for good health. It takes consistent effort on your part to keep your body ticking. So, put aside some time everyday to take care of your good health and well being!